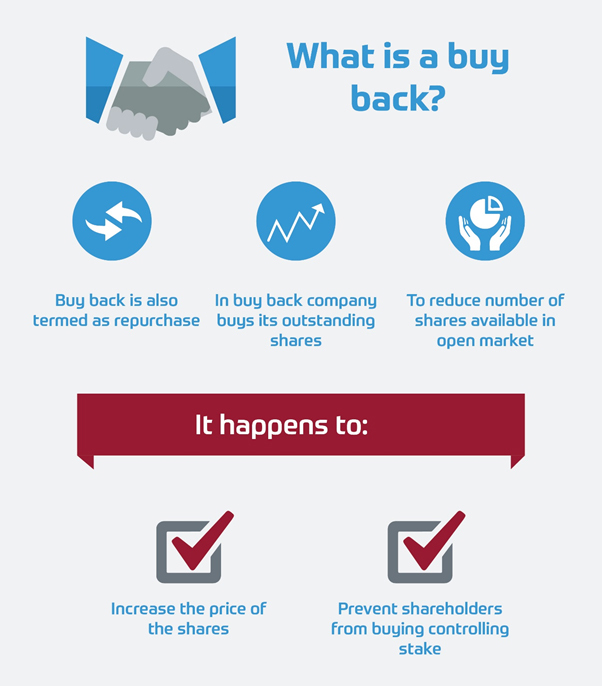 In a buyback, the company buys its outstanding shares which are held by the shareholders in order to reduce the number of shares available in the open market. You might have often wondered how companies maintain their controlling stake despite so many shares being bought in bulk many times. It is observed that the companies often invest in themselves by repurchasing their shares to maintain the controlling stake with them. This repurchase is termed as a buyback. In a buyback, the company buys its outstanding shares which are held by the shareholders in order to reduce the number of shares available in the open market. A buyback results in increasing the proportion of shares held by the core company investors. This brings in more power to them in terms of decision making. Buyback could even result in the rise in the price of shares as the supply i.e. the number of outstanding shares is reduced, while the demand among the shareholders remains the same. This looks more like a higher demand with a lower supply, which in turn causes price rise. If the company is going bullish with its current operations, then the stock price would see a rise, post a buyback if the Price/Earnings ratio (P/E) remains the same. In order to gain an in-depth understanding of what a buyback is, it is important to understand the reasons which drive the company to buy back its shares. Increase in the shareholder’s value: Shareholder’s value is measured in terms of EPS (earnings per share), which is the allocation of the company’s profits among the stocks. During a buyback when the company buys its shares, the number of outstanding shares decreases, while if the company maintains its profit levels the EPS eventually increases. Thereby, the value of the shareholders will increase post a buyback. The shareholders, who have decided to keep the shares even during the buyback, will now be having a more valued share due to rise in EPS, also a higher percentage of the ownership in the company. Boost the price of shares: In many cases despite putting in a lot of efforts for growth, the price of the shares still remain the same. Companies try their best to keep the price of their shares rising in order to maintain the net value of the company in the market. One such way to do so is by repurchasing the outstanding shares or buyback. Company repurchases its shares, which results in higher prices due to a lower supply than the demand in the market. Once the price of the shares increases, it is sometimes observed that the company could even sell the repurchased shares back. This happens if the reason to purchase them was only to boost the stock’s prices. To maintain the controlling stake: Due to many reasons, core investors of the company might lose the controlling shares when the outstanding shares in the market are in excess. In such a case, in order to maintain the controlling stake of the company, a buyback takes place. Tax benefits: Sharing profit with the shareholders by announcing dividends could be less beneficial in terms of tax, as dividends are taxed at the rate of 28.84% as Dividend Distribution Tax (DDT). A buyback is taxed as capital gains (especially when held for more than a year), which results in tax benefits for the company. Excess cash: When the company holds excess cash, they buyback to boost the value instead of investing in alternative assets, strengthening the investors in long-term with an increase in the value of their investments.